On Sunday, April 15th, the Olympia FFA Chapter held their annual Chapter Banquet. There were 51 FFA members and over 100 guests present at the banquet. On this night the FFA recognizes all of the FFA members and the accomplishments. A few of the awards included Star Greenhand, Lane Schweigert, Star Sophomore, Cavit Schempp, Star Junior, Molly Schempp, and Star Senior, Josh Kindred. To begin the night, everyone met in the cafeteria. After a short speech from Mr.Hoffman, tables were released to eat a complimentary dinner. While everyone was eating, a slide show of all the Career Development Events, also known as CDE’s, was shown. After dinner, a meeting took place in the auditorium. During the meeting, many awards were handed out and members were recognized for their accomplishments. Throughout the meeting, slide shows, such as senior pictures, were also shown to the audience. 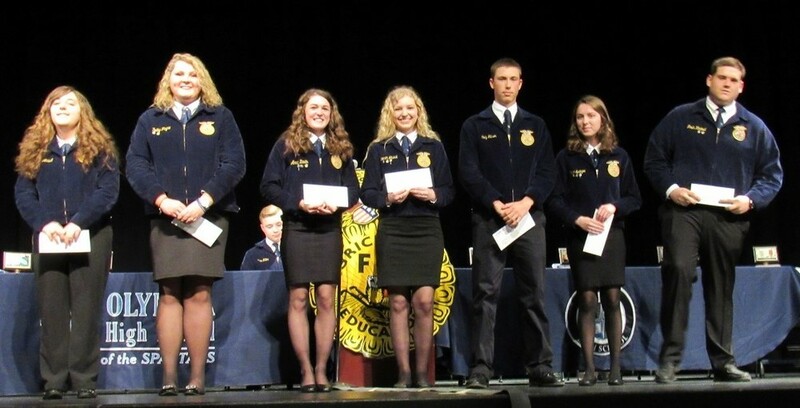 One of the many highlights was the Olympia FFA Alumni and Supporters scholarship awards. Seven Olympia seniors were awarded college scholarships ranging from $500 to $1000 each. Scholarship winners included: Josh Kindred, Cody Gibson, Claire Springer, Karmen Glueck, Anna Davis, Shelby Payne, and Bree Abbott. To close the ceremony the old officer team gives their duties to the new officer team. The old officer team of 2017-2018 was President, Karmen Glueck, Vice Presidents, Josh Kindred, Lane Miller and Molly Schempp, Secretary, Claire Springer, Treasurer, Anna Davis, Reporter, Cody Gibson, Sentinel, Dawson Banister and Historian, Cavit Schempp. The new officer team consists of President, Molly Schempp, Vice Presidents, Lane Miller, Dawson Banister, and Josie Litwiller, Secretary, Alyssa Casey, Treasurer, Cavit Schempp, Reporter, Kaylin Simpson, Sentinel, Dwayne Hancock, and Historian, Lizzy Davis.